In the old days, Montagnano was an important castle under the jurisdiction of the Cathedral of Arezzo. The castle was owned by the powerful noble family of Ursi-Griffi until the year 1205. 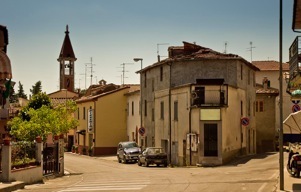 The village had a cartain autonomy and its own statutes until 1774, when it was joined to the municipality of Monte San Savino. The church of San Prospero, which dates back to the XVI century, presents a neo-Gothic facade dating back to the beginning of the twentieth century.